Assisi (AsiaNews) – The Day of Reflection, Dialogue and Prayer for Peace and Justice in the World ended in the simplest and most poetic way, with an exchange of peace among participants. 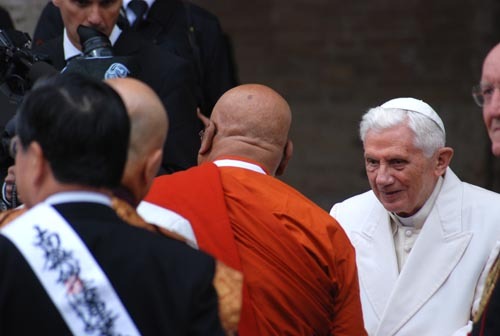 This was preceded by the lighting of small lamps that a group of young people handed out in silence to the 300 representatives who had come to Assisi on Benedict XVI’s invitation. When it was time to make the exchange of peace, Franciscan friars released dozens of white doves. Some alighted on the hands of a number of representatives. At the end of the meeting, Benedict XVI and those who so chose visited the crypt to pray in front of St Francis’s tomb.